They say life is what happens when you’re busy making other plans. That’s what I was thinking this morning when I checked my email and noticed a message from Apple’s iTunes service which thanked me for making several in-app purchases of a Sega game. Awfully nice of Apple. The only problem is that I don’t have that app and I never bought any of that stuff. So I logged into my iTunes account only to discover that my account balance had been drained, the telephone number on my account changed to something unrecognizable, and the credit card number I had on file with iTunes removed. Clearly, Day Two was not starting out well. I spent breakfast alternating between eating and talking to the credit card company about cancelling that card. I also tried to get in touch with Apple. As expected, they make that virtually impossible. I don’t know how my iTunes account was hacked, but now I’m a little paranoid about the wireless connection here in the hotel. Marriott has a very nice place, but their free wifi is completely unsecured and it’s a major security risk for anyone using it. Uh, that would include me. If you’re not aware of the risks, just try Googling “firesheep” for a long litany of information about a simple Firefox plugin which can rip off all your private information without your knowledge when you’re connected to any unsecured wireless network. Think about that the next time you’re at a Starbucks or Panera Bread browsing happily away. I suppose the fact that I know about this risk and choose to use the wifi anyway makes me more of an idiot that someone who just doesn’t know any better. On the plus side, this hotel has hard-wired internet access in the room as well, so I might have to start using that instead. It’s still unsecure, but it would take more than a savvy hotel guest to swipe my personal information. The day wasn’t all bad. For one thing, the breakfasts here at the Marriott are amazing. Then I discovered that my rental car has XM satellite radio — and the subscription is active. Sure, I’m only on the road 15 minutes each way between Simuflite and the hotel, but at least I can be enjoying great music enroute. Day Two of training was a good one. I’m starting to get adjusted to the schedule, the timing of breaks, etc. You might not think it’s important, but I’ve learned that those things have a big impact on your ability to focus and absorb the material being presented by the instructor. They’re still struggling with projector issues in our classroom, so we’ve been relocated to a different room and spent the morning there studying the G-IV’s avionics. There’s quite a lot in that panel, but I feel like I’m catching on to it pretty quickly thanks to thousands of hours spent teaching and flying advanced “glass cockpit” avionics back home. Someone told me that Gulfstream loves acronyms, and boy were they right. What I find particularly challenging is the way Gulfstream has adopted names which differ from the commonly accepted ones used in the rest of the aviation world. For example, instead of calling the screen with the important flight instruments a PFD (primary flight display), they call it a “display unit” (DU). The moving map is typically called a Multi-Function Display (MFD), however Gulfstream refers to it as a Navigation Display (ND). The computer which runs those displays is called a Symbol Generator. Imagine a list like that which continues for 15 or 20 pages and you’ll see what we’re up against. To be fair, this airplane was designed in the late 80’s and produced in the 90’s, meaning it came on the scene before the nomenclature we take for granted today was firmly ensconced. On the more serious side, we did get a tour of the simulator bays, the impressive library Simuflite maintains, and spent a couple of hours in an avionics simulator. This sim is a combination of photographic representations, actual avionics boxes, and flat screen computer displays. In this photo, you can see a couple of my classmates monitoring the system as it executes an instrument approach procedure into Anchorage, AK. 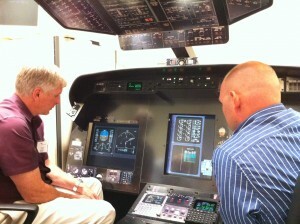 The captain’s PFD — er, I mean ‘Display Unit’ — is a flat panel computer screen which simulates his side of the panel. The left side flight instruments are represented by a life-size photograph. The captain’s side also has a working Display Controller and autopilot in the glareshield. But the only real FMS is on the co-pilot’s side. So the left seat pilot would “fly” while the right side guy handles the FMS, programming the flight plan, loading approaches, etc. The setup has a lot of “sim-isms”, but it got the job done. There is much to love about this airplane. For one thing, Gulfstream’s documentation is first-rate. I love the straight-forward descriptions and diagrams in their manuals. The systems redundancy is also impressive. Dispatch reliability is clearly a priority for them, because the plane is equipped with two of almost everything, and/or a procedure for flying without it. The most humorous example I’ve found thus far is a procedure for dispatching the airplane with the start valve inoperative. Without going into too much detail, the start valve is a literally a valve in the engine which must open and close in order for the thing to start up. So how can you fly when it’s not working? Well, Gulfstream came up with a way. Basically, you get a guy to stand on a ladder next to the open engine cowling and manually wrench the start valve open. Once the engine lights off, he uses the wrench to physically close the valve, then close the cowling and hopefully extract himself from that position without being sucked into or blown away by what is now a screaming Rolls-Royce Tay 611 turbojet engine. That, my friends, is good times. Not for the poor mechanic, mind you — but for me, as I tell the story for years to come. It’s almost enough to make me hope I encounter that situation once just for the sheer absurdity of it. Alas, the Gulfstream is a very reliable jet from all accounts I’ve received so far, so these things will likely remain confined to airplane manuals and flight simulators. The schedule calls for another 9-10 days of ground school, followed by 8 simulator sessions of around 4 hours each over the next week, followed by a checkride. Obviously there will be studying on my own after and around the formal class schedule, but I’m trying not to overdo it. I’ve been told that you need time to relax your brain if you want to any of this stuff to “stick” for the checkride. When I look at the schedule, it doesn’t seem like there’s much time in the sim, but they’ve been using this schedule for years so apparently it must work! I believe I have spent over $100 on apps I never wanted on our Ipad with the kids and they would not fix it. Not really worth it when you add it all up. If you could apply conspiracy on APPLE, I am sure it would apply. That’s why we only buy iTunes cards and load money in as needed…. We loaded our Ipad with our credit card number. When it ask for conformation to charger your account it does not tell you what for or how much it just ask for your password. This also works for several minutes (at least 15) after you type your password in that it will continue to charge your credit card. My 3 year old confirmed a $150 charge for an online game. Who in their right mind would pay $150 for credits to an online game? It is devious and wrong and Apple knows what they are doing, they also make it very hard to get your money back, if they bother to give it to you. I like Apples products (Ipad) , I just don’t trust them as a company, they are really shady to me. Todd, sounds like Apple has turned into the thing they railed against in that famous 1984 Superbowl ad. As their market superiority on product diminishes, I suspect so will their loyalty from my experiences.